"I Seem To Be Having Tremendous Difficulty With My Lifestyle." Douglas Adams was a trailblazer of the "quirky science fiction" subgenre, especially in his display of the precise randomness of the universe — when imagining all of space, anything is possible, or in fact, likely. 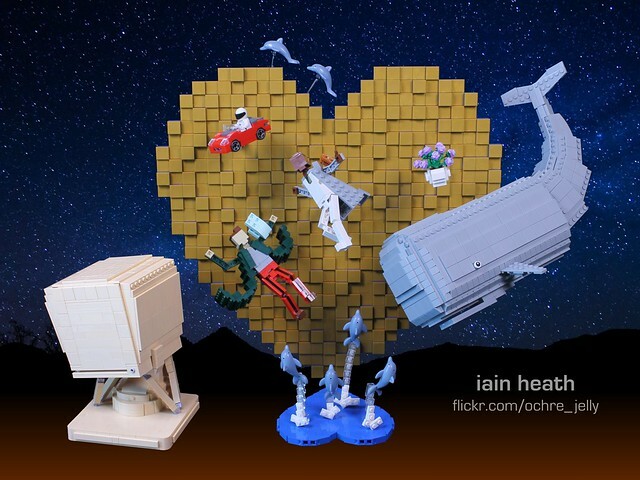 Iain Heath captures a corner of that qunitessentially peculiar world with his tribute to The Hitchhiker's Guide to the Galaxy, which features, among other things, Marvin the depressed robot, a strikingly short-lived sperm whale, and a fleet of musical dolphins.